Well, we didn’t technically hear it over all of the thunder, but a tree on the property like between out house and a neighbor’s most definately fell through the fence and into our yard. 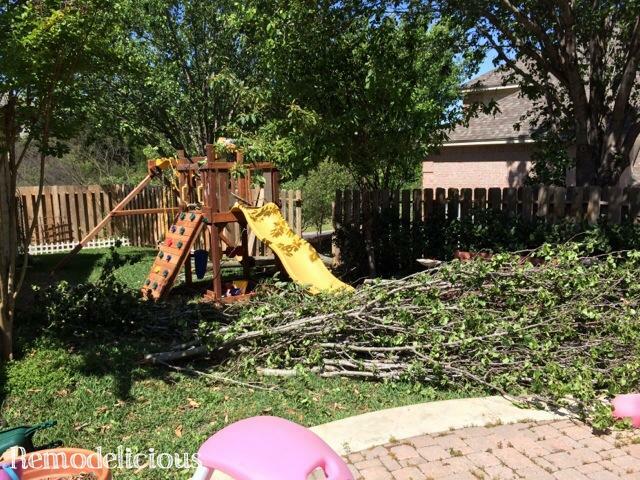 Fortunately, it fell in the playscape which kept it from hitting our house with anything more than twigs. 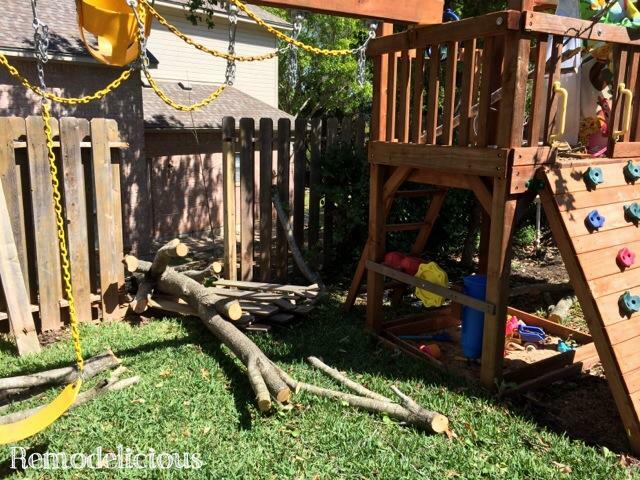 The roof of the playscape and a 5.5 foot section of fence are destroyed as they broke the fall. 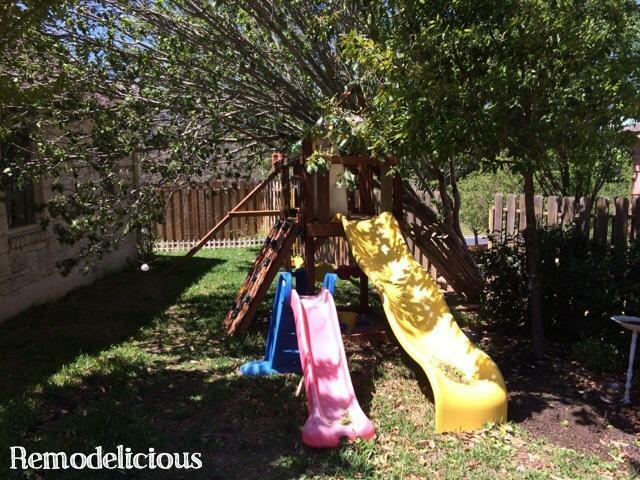 The good news is, there’s no structural damage to the house or playscape. Whew! The bad news is, we have a major mess to clean up. Because who doesn’t need more to do? We decided to clean the mess up ourselves which will save a ton of money they would otherwise be out insurance deductible. So here’s to taking a break from more fun projects to do something necessary. Because we all need to from time to time, right? Can you believe that the trunk broke completely off of it’s roots and fell over? It wasn’t even that bad of a storm, just a quick & dirty one. A gust of wind must have come up the hill just right. 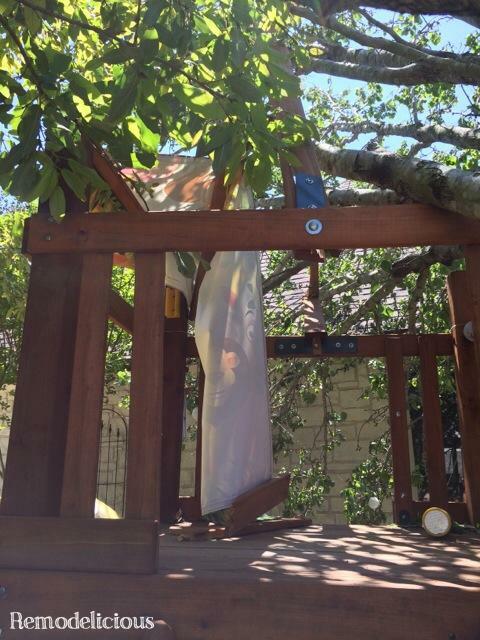 Fortunately, it fell just onto the roof of the playscape and not through our bedroom window. It has been a great source of entertainment and awesome kid-composed photography. We first had to start dismantling the tree to get it off of the playscape & fence. 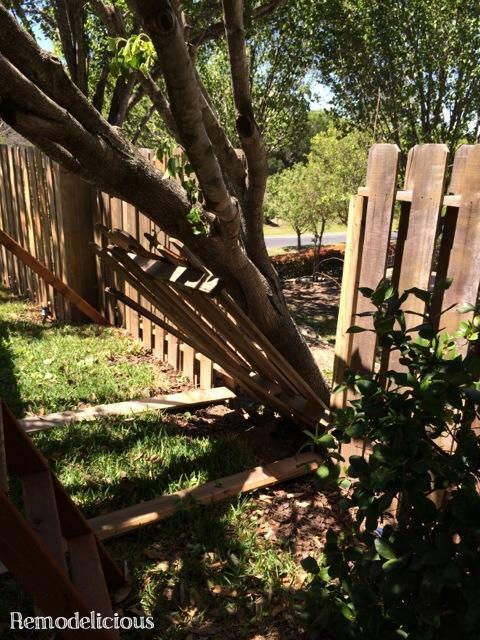 Now that it’s in more friendly bits, we’re working on getting the fence repaired. Gotta love central Texas weather!